Another extremely early rise did not help Gerard feel much better, and by the time we got to the port at 6am he was starting to have second thoughts about starting the trip, but we were all hoping that a good dose of drugs bought the previous evening and four hours to sleep on the crossing to Melilla would make him feel better. 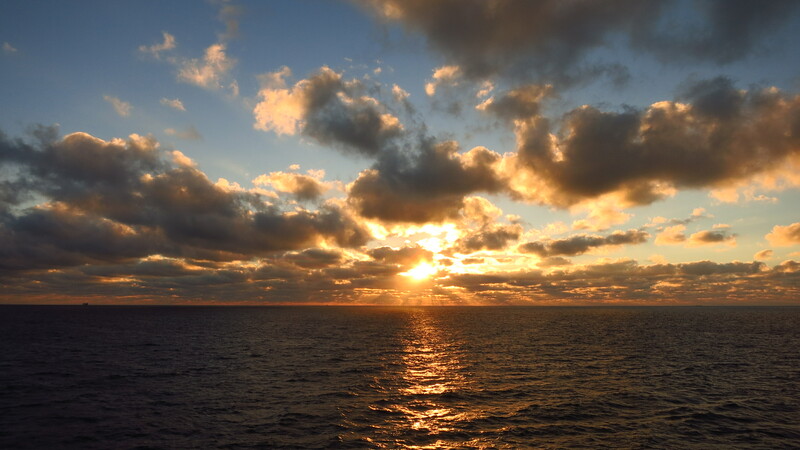 The rest of us spent our time on the upper deck, the only passengers fool enough to brave the cold to contemplate the sun rise over the sea. 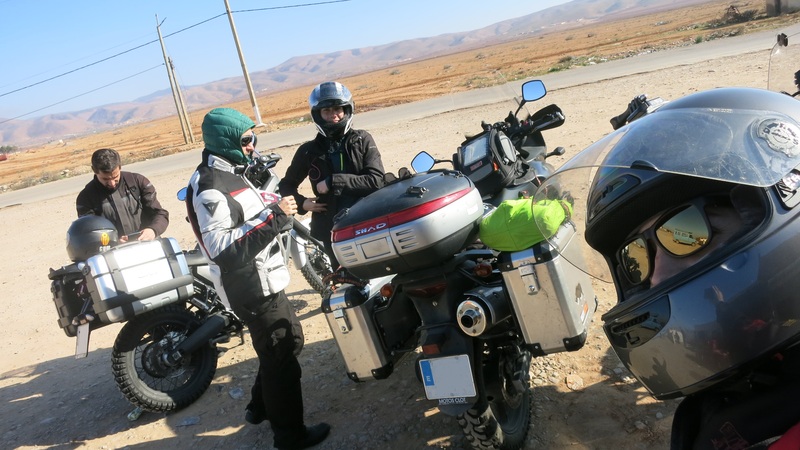 When we got off the ferry the temperature was much higher, and after filling the tanks to make the most of Melilla’s special tax regime, we rode across the town to the border, where we officially crossed the door into Africa. Well, actually, we first had to try to get our bikes across a human flood trying to get across the border. Not the immigrants or refugees that you hear about in the news, trying to reach this small piece of EU territory in Northern Africa, but a mob of Moroccans that cross the border to buy things that are cheaper than in Morocco or impossible to find there and then take it to their country to sell it. To prevent the border facilities from being overrun with people carrying boxes and bags the guards only open the pedestrian crossing at given intervals and then all the people waiting make a run for it. We were riding the bike behind a van and a short distance from the vehicles entrance we saw a lot of people sitting around and waiting, Then, as luck would have it, just when the van was driving over a zebra crossing the guards must have opened the doors, because everybody suddenly stood up, grab their stuff and dashed to the gate. In a matter of seconds, we were surrounded by a human mass, and I feared that someone would bump into or be pushed against us and with such a heavy bike and a passenger I would lose balance and end up on the ground. 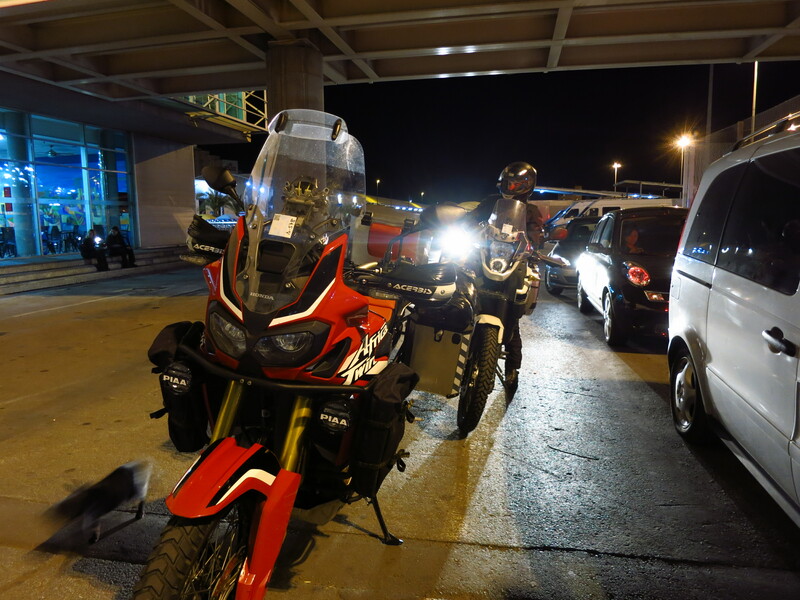 Once we had managed to get past the crowd and into the border compound itself the chaos continued – we had prepared the import forms for the bike, but we still had to fill in a small immigration form, get the passport stamped and get the import form signed and stamped at the border and at customs. The immigration forms we had to fill in were nowhere to be found, and the reason was that the ‘helpers’ that are found in most borders had them. The ones here were very persistent, and the attitude of the people working at the border did nothing but encourage them – there were no signs and no explanations at all. We navigated our way through that mess with the ‘help’ of one of those guys and in a matter of minutes had all the paperwork complete and just had to wait for the rest of our group while we enjoyed a curious show – a ridiculously overloaded car was trying to carry more goods than what I imagined the import regulations allowed, and a border guard had taken the wheel and was driving the car into a separate area of customs, while some men unloaded the trunk as the car was moving and threw bags over the fence where their friends were waiting to avoid having them confiscated. Once we were all done, we left the border compound, exchanged some money and hit the road south. There was a lot of police, but nobody stopped us, and once the worst of Nador’s traffic was left behind, we enjoyed quite good roads until we found the motorway that led to Fes. After the rest on the ferry and some food, Gerard was feeling better and had decided to go ahead and continue the trip. We had started riding quite late because of the border crossing, and we were worried that nightfall might catch us before reaching the city and finding the place where we were staying, but we managed to get there just after sunset and ride into a maze of backstreets in a neighbourhood overlooking the medina, looking for the house where we were going to spend the night. We had booked rooms in a property through AirBnB that was advertised as a ‘palace’, but the plain metal door we ended up in front of looked quite uninviting. 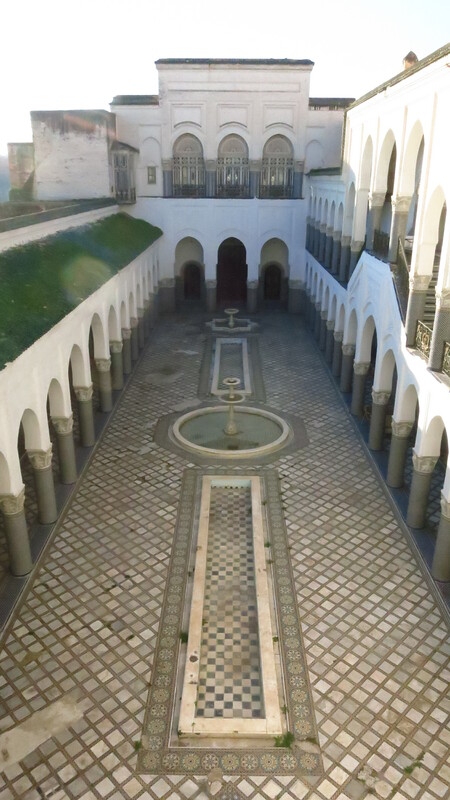 The owner came out and told us that we were staying further down the road, and led us to the palace. And what a palace it was! By now it was already dark, and after going through a metal gate we parked the bikes in the garage of a separate building and took our stuff down a street, across a patio, through a big doorway, down an alley… after few hours of sleep and lots of hours of travel, I was completely disoriented and felt I was floating from one place to another, until another big wooden door opened and we were led into a courtyard that could very well have been in the Alhambra. 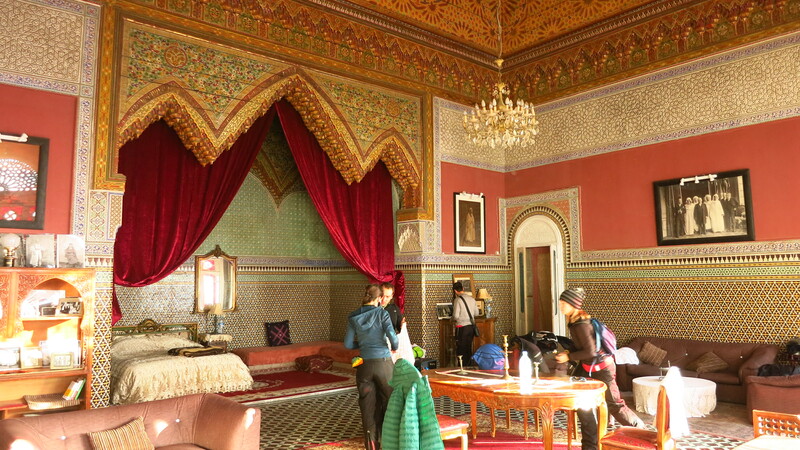 After crossing it and walking up some stairs we reached our room – a cavernous space of about 100 square meters, ceilings over six meters tall decorated with elaborate carved and painted wood, thick curtains… it was unbelievable. 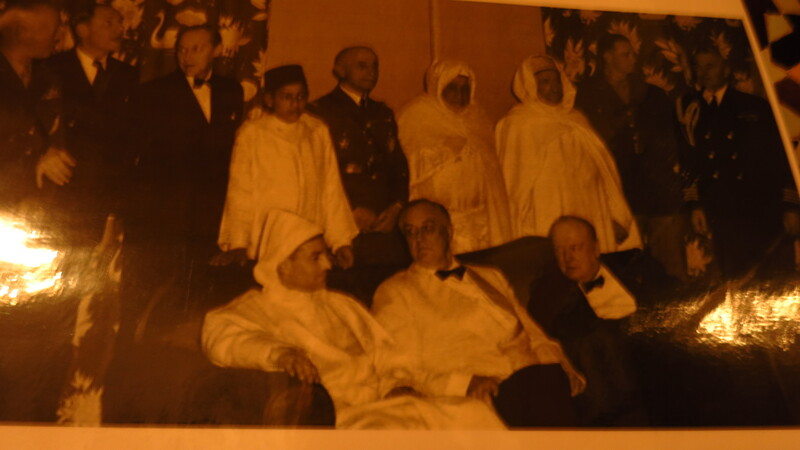 It seems that the owner’s grandfather had been the Pacha of Casablanca and this was his second residence, where he kept his four wives and at least 12 courtesans while he was meeting the likes of Winston Churchill and Theodore Roosvelt. Overwhelmed by all the things we had experienced in the last 24 hours, we crashed in our beds under several layers of blankets and fell fast asleep. This entry was posted in Moroccan Christmas 2016, Travel and tagged Almeria, ferry, Fes, Honda CRF 1000L, Melilla, Morocco by Kilian. Bookmark the permalink.